Today we travelled south from the Barossa to another equally famous wine region the McLaren Vale, 160km and another 1,600m of climbing. The accumulated efforts on winding roads, long climbs, heat and wind are proving why we call this week a Challenge not a ride! We woke to yet another spectacular morning. Crisp and clear, more carbs, more coffee and then we were on the road, anxious to cover as much ground as possible before our “friend” from the north west reappeared. Norman Ridge in yellow. Norman is a first timer to Chain Reaction and has raised over $10,000. Paul Wilson in white is from Dexus. 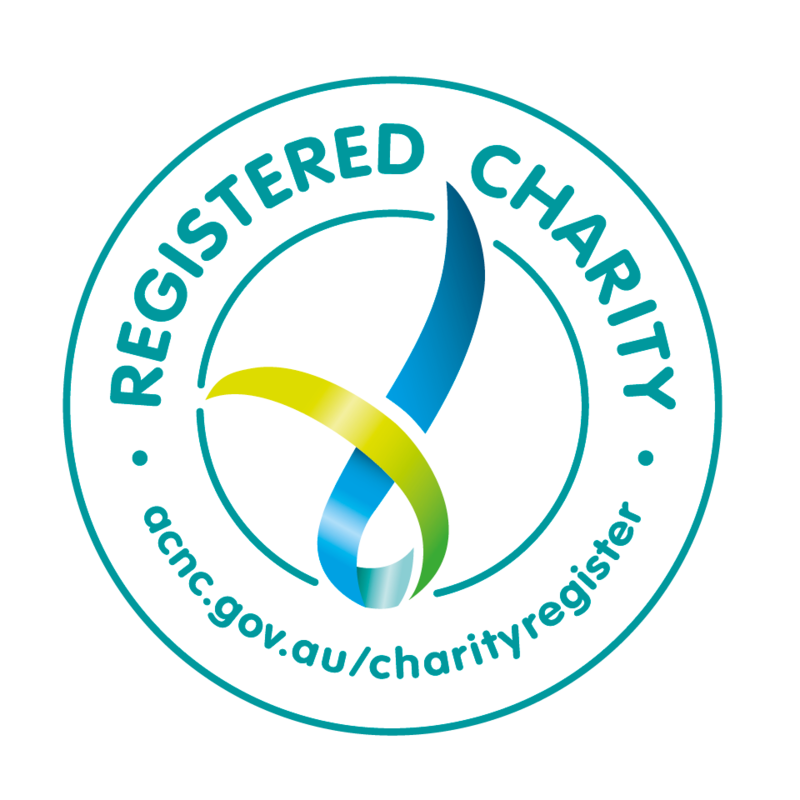 Both Paul and Dexus have been long time supporters of Chain Reaction. 70km were disposed of in our first two and half hours, a drink stop, and the riders were on the road again. 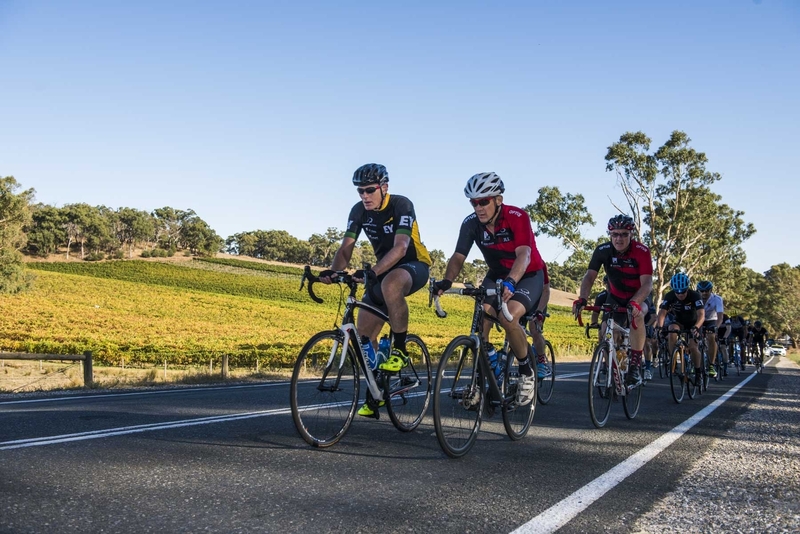 The peloton was early into the picturesque town of Strathalbyn for lunch at the Commercial Hotel and in good spirits. Our friend from the North West returned during lunch bringing soaring temperatures, dust storms and all sorts of vegetation blown onto the road (gum tree branches on the road are not a rider’s friend). There is nothing standing in the way of these winds as they roar in off the desert and rip into the bunch. Riding into a headwind is a grind. Huge amounts of energy dissipate into the bitumen and speeds are reduced. A side wind is even more unpredictable. It can blow you across the road several meters in one gust (just one reason why a metre matters). The bigger guys suffer the “spinnaker” effect from which ever direction it blows, while the smaller lighter riders need to battle and concentrate just to keep upright. 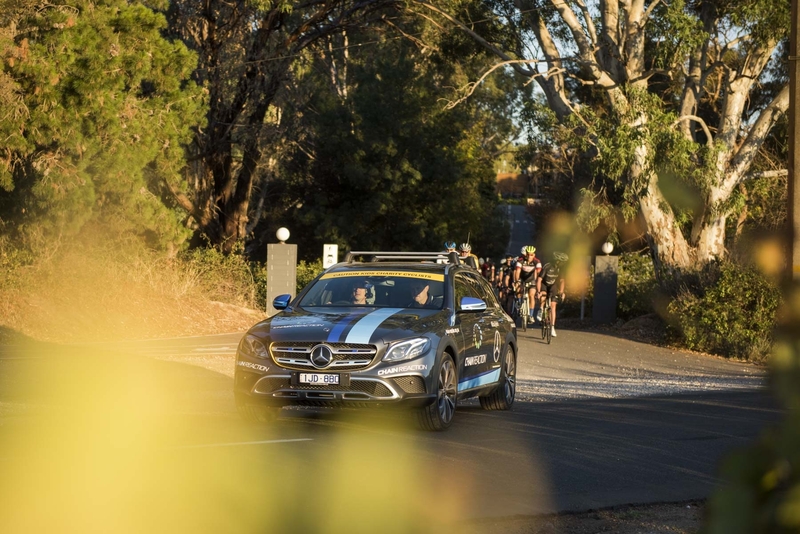 Only solid team work with stronger riders sitting on the front and on the windward side of the bunch to break the wind ensures the whole bunch can keep travelling at a reasonable pace. We have already briefly mentioned our support crew in prior blogs, they are the secret ingredient to a Chain Reaction Ride. No crew, no ride; it is that simple. Everyone who is not riding a bike are support crew. We have masseurs that double as truck drivers, feed station soigneurs plus multimedia experts, bike mechanic and a paramedic. We travel in convoy. Tim Chadd our ride director is in the Mercedes E2 220D out front. Where Tim goes the peloton follows. He is our eyes, our forward scout. Behind us sits Cindy our paramedic and behind her Nashy our Mechanic. Our other support vehicles either leap ahead to prepare a feed station or sit further back on call to solve any issues that may arise. Tim, Cindy and Nashy control the traffic so we the riders are safe. Riders with race radios will attest to their particular language; “open the door” and traffic passes, “close the door” and Cindy stops vehicles passing, “single file” and the bunch quickly snaps into a single line to allow vehicles easier passage; “free play” and riders respond by upping the tempo, “mechanical” and Nashy is beside a rider before he is off the bike changing a wheel, fixing a chain….. it is professional and it keeps us all safe. Thanks Crew! Back to the ride. The riders earnt every kilometre after lunch. A 14km climb up Paris Creek Road in a dust storm blew the bunch apart as riders fought for breath as they battled double digit sections. 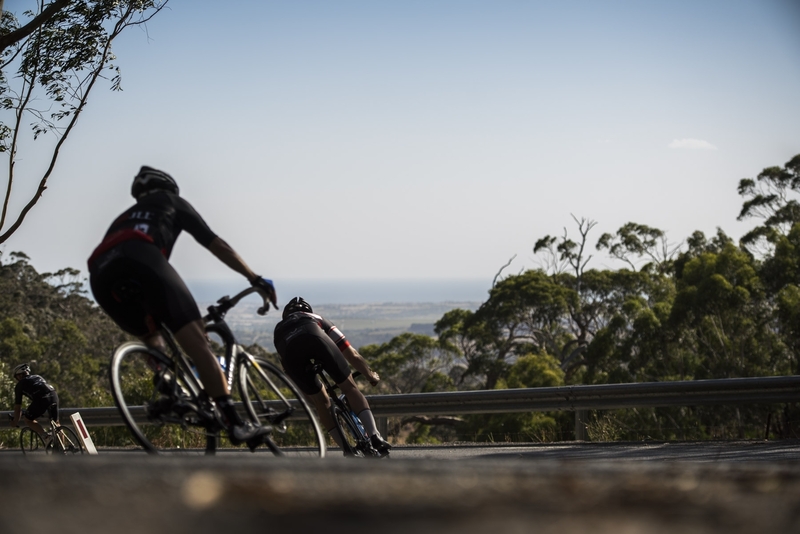 Upon cresting the climb riders were greeted with glimpses of St Vincent Gulf and the fertile but parched plains of the McLaren Vale. More rolling hills along the ridgeline sapped the last energy from the legs before a fast descent down into McLaren Vale and a very well learnt "recovery drink". 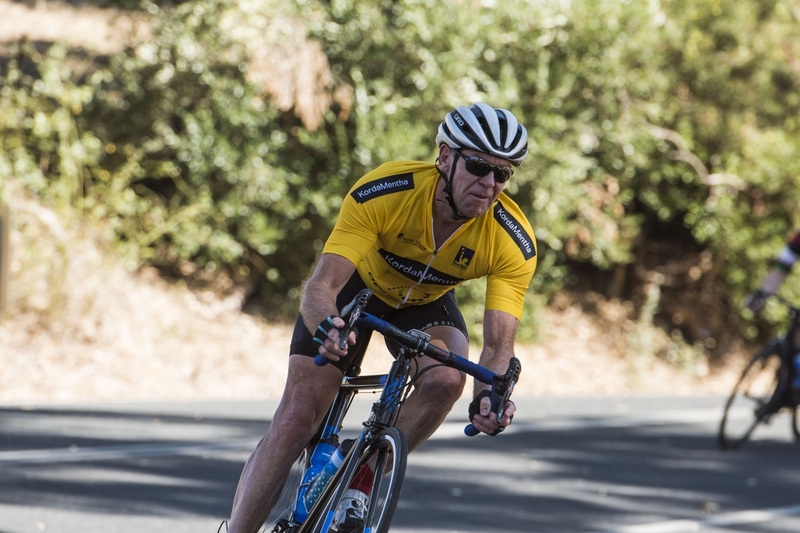 Tomorrow we face a TDU classic, Willunga Hill and another 150 plus km to Victor Harbor. But for now we rest.